This course consists of three sections, each worth 24 contact hours (total of 72 contact hours for all three). Diseases and Disorders: A Nursing Therapeutics Manual puts information on more than 240 diseases and disorders at your fingertips. 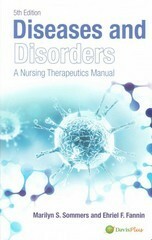 The only book of its kind to include information on Diagnosis Related Groups (DRGs). A-Z organization for ease of finding topics. Helps you prioritize interventions by highlighting the primary nursing diagnosis. Makes locating pertinent test results quick and easy with Diagnostic Highlights tables. Outlines the drugs most commonly used for a disorder in Pharmacologic Highlights tables. Includes separate headings for psychosocial issues. Sample of Content: Abdominal aortic aneurysm • Abdominal trauma • Abortion, spontaneous • Abruptio placentae • Acid-base imbalances • Acromegaly • Acute adrenal crisis • Acute alcohol intoxication • Acute respiratory distress syndrome • Adrenal insufficiency (Addison's Disease) • Air Embolism • Alcohol withdrawal • Allergic purpura • Alzheimer's disease • Amputation • Amyloidosis • Amyotrophic lateral sclerosis, and much more. No waiting — your certificates of completion are available online! Even if you order quizzes to be shipped, they will appear online in your Customer Account. As soon as you pass each online quiz, your certificate of completion will automatically appear in your Customer Account. Your certificate will remain in your Customer Account so if you need a copy in the future, just print it.